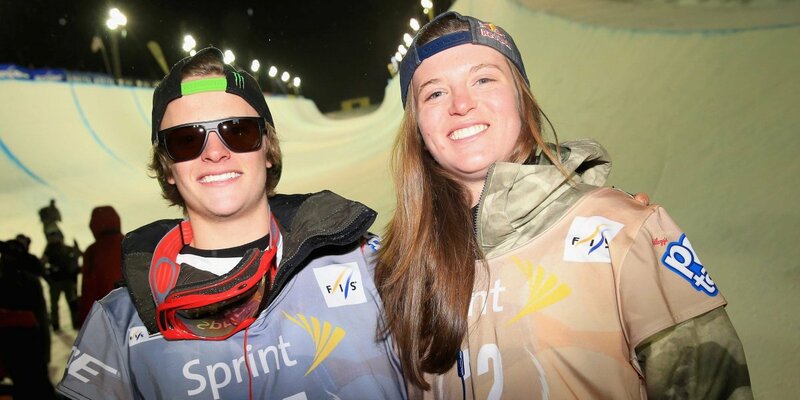 Taylor and Arielle Gold hope to both ride in the US Open Snowboarding Championships at Vail, which they say will be a much better show than the Sochi Winter Olympics (Getty Images/USSA photo). More than 50 Olympians from this month’s 2014 Sochi Games will descend on Vail next week for the annual Burton US Open Snowboarding Championships, including current and past gold medalists such as Kaitlyn Farrington, Jamie Anderson, Hannah Teter and Kelly Clark. Conspicuously absent from this year’s start list is two-time halfpipe Olympic gold medalist and five-time defending US Open champion Shaun White, who wound up just off the podium in fourth at Sochi. Russian-born Swiss rider Iouri Podladchikov, who dethroned White for gold, also won’t be in Vail. Sochi halfpipe bronze medalist Taku Hiraoka of Japan will ride at the US Open – the second year the event’s been held in Vail – but silver medalist Ayumu Hirano, a Ski and Snowboard Club Vail athlete from Japan, won’t compete here, according to organizers. However, 2014 X Games superpipe gold medalist Danny Davis will compete in Vail in both halfpipe and slopestyle. The competition gets under way Wednesday with the semifinals of both men’s and women’s slopestyle — an event that made its debut at the 2014 Olympics but has been a part of the US Open for 12 years. All events are free and open to the public. The first ever women’s gold medalist in slopestyle, Jamie Anderson, of Squaw Valley, Calif., will take on a deep field that also includes silver medalist Enni Rukajärvi of Finland. On the men’s side, gold medalist Sage Kotsenburg won’t be in Vail, but silver and bronze medalists Stale Sandbech of Noway and Mark McMorris and Canada will compete in Vail. Both men’s and women’s halfpipe semifinals begin Thursday, with Salt Lake City’s Farrington, another Ski and Snowboard Club Vail Olympic gold medalist, taking on a very deep field that includes three of the last four Olympic halfpipe gold medalists. Teter, who won gold the 2006 Torino Winter Olympics, and Clark, the 2002 Salt Lake City gold medalist and bronze medalist at Sochi, will try to knock off the upstart Farrington. World champion Arielle Gold, of Steamboat Springs, also hopes to be in the field. “I’m definitely not counting it out,” said Gold, 17, who crashed in training at the Sochi Games and was knocked out of the competition. “I’m doing shoulder rehab as much as I can and just trying to see if I can get there. Video of her training crash went viral on the web and underscored the shoddy design and condition of the halfpipe – the second straight Olympics where warm coastal weather has wreaked havoc in arguably the Games’ most telegenic event. But Gold is already thinking about the 2018 Winter Olympics in South Korea, where she said a friend of hers at NBC already scoped out the venue and reported conditions should be much colder and the pipe should be in better shape. She added that Sochi showed there’s a changing of the guard in the sport, with a new wave of young riders challenging the established veterans. Her brother, rookie Taylor Gold, also bore the brunt of terrible pipe design and bad weather at Sochi, where practice was limited while workers tried to fix the too-narrow pipe, chewing up the bottom with excessive snowcat traffic. Taylor Gold ran out of room for his final trick in his final qualifying run, missing it and subsequently missing the finals. He also feels confident snowboarding fans will see a much better product at the US Open in Vail, where top pipe designer Snow Park Technologies (SPT) cuts the halfpipe. SPT was not the pipe designer for the Sochi Games. An Olympic Athlete Celebration event will take place from 6 to 7 p.m., Wednesday, March 5, at the main stage at Solaris. Open to the public and free of charge, the event will be hosted by legendary sports commentator Sal Masekela, who will welcome the Olympians to Vail and feature interviews of their experiences in Sochi. There will be giveaways, music, fireworks and more (see the full entertainment schedule at www.Burton.com/USO). For a full list of competitors, full broadcast and webcast schedules and event details, go to www.burton.com/USO and follow the action under hashtag #BurtonUSOpen.